Note: David Weddle helped write the DS9 episode "Inquisition" which introduced Section 31. They are the self appointed protectors of the Federation. Amoral, shrouded in secrecy, answerable to no one, Section 31 is the mysterious covert operations division of Starfleet, a rogue shadow group commited to safeguarding the Federation at any cost. 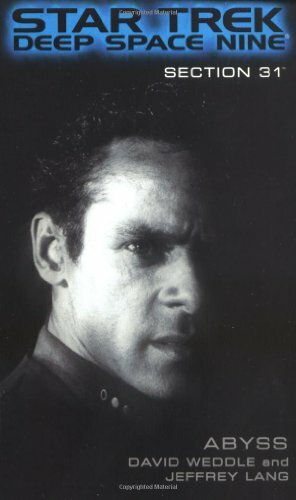 Mere days after the startling events of AVATAR, Dr. Julian Bashir faces his darkest nightmare when Section 31 compels him to undertake amission to stop one of their own. But this renegade is no ordinary agent. Like Bashir, Dr. Ethan Locken is genetically enhanced, a human superior in body and mind. But Locken dreams of remaking the galaxy in his own image and creating a new human empire based on the example of the infamous Khan Noonien Singh. And as he begins to understand the terrifying truth about his opposite number, Bashir will learn more about himself than he ever wanted. NO LAW. NO CONSCIENCE. NO STOPPING THEM.